It’s the (not so) wonderful time of year again. All around me, observant Jewish housewives are desperately cleaning out their pantries, trying to use up any chometz ingredients (leavened grain products, forbidden on Passover). I did an inventory of my pantry recently, and was kind of horrified at the amount of stuff I have to use up before Passover comes in a couple of weeks. I think the most surprising thing I found was a box of pancake mix. Not to knock those who love pre-made mixes, but I am dead against them. A recipe calling for cake mix is an insult to my abilities as a baker. I periodically make pancakes- from scratch. I don’t know how this box came to exist in my pantry, but I did a little searching online and was thrilled to find a great way to put the pancake mix to good use. Why of course it’s a cookie. How did you guess? 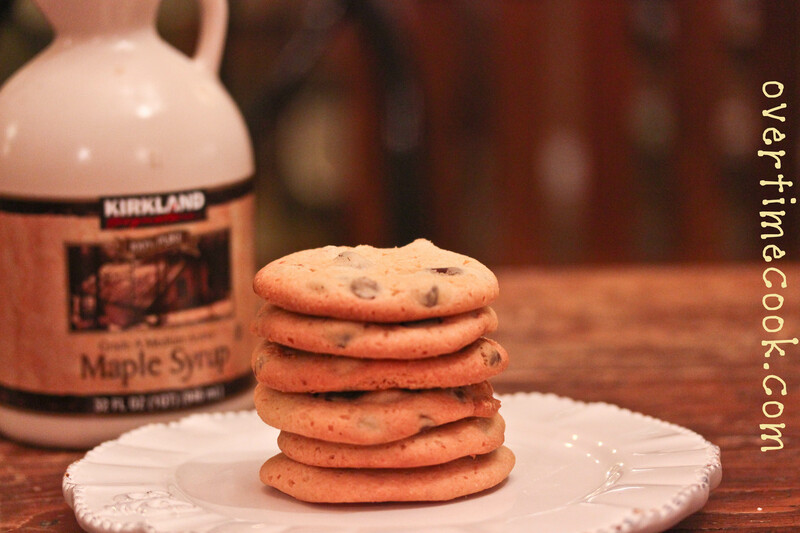 These cookies a) are ridiculously easy to make, b) are a great combination of a pancake and a chocolate chip cookie and c) have an amazing maple flavor. Not enough reasons to make them? Sorry, you’re impossible to please. Note: I doubled this recipe and it still didn’t make that much. In a medium mixing bowl, stir together the butter, honey and maple syrup. Stir until combined. Add the pancake mix and stir until fully incorporated. Fold in the chocolate chips. Use a medium cookie scoop (or a tablespoon) to drop the dough (it will be pretty thin) onto the prepared trays. 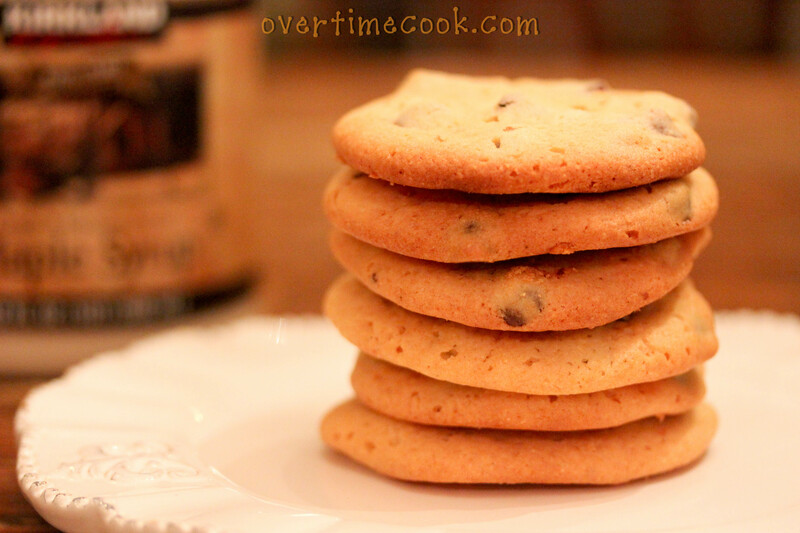 Leave about 2 inches of space between cookies. Bake at 350 for about 15 minutes, until golden brown. 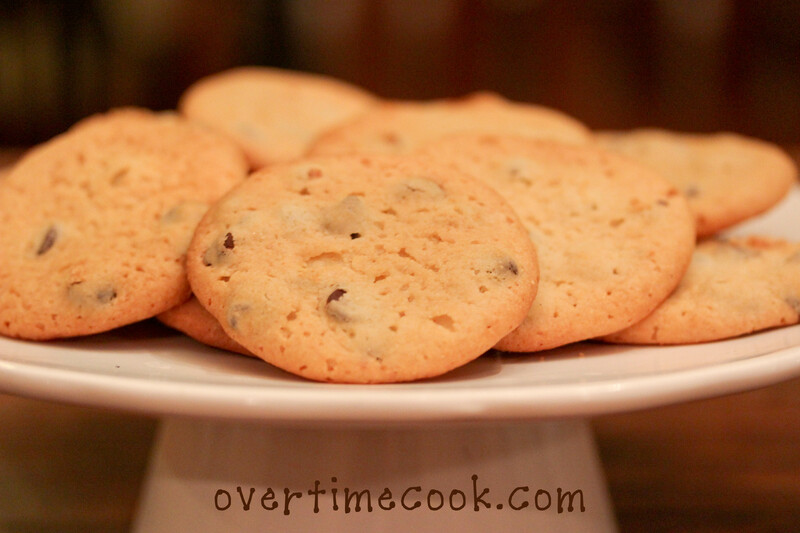 Remove from oven and allow cookies to cool for a couple of minutes on the tray, then completely on a wire rack. yum. but i’m not buying pancake mix just for this right now! 🙂 got enough pasta etc that we’re eating up! What an interesting thought to make cookies out of pancake mix. Pancake cookies! Another great and quick breakfast idea 🙂 Looking forward to seeing what you did with the Oreo cookies and graham cracker crust! What if my pancake mix is the type that needs to add egg and milk? Can it still be used? I can’t speak for every pancake mix, but the average mix will work with this recipe. Instead of egg and milk you’re adding the other ingredients. ahhh I see it now!!!! :0) I will be trying these soon! If I don’t have maple syrup what I can use. You can use honey or agave syrup. I have made pancake mix muffins before but this I had to try because there was a box in my larder. I used creamed honey, vanilla and used M&Ms…yummy. I can’t wait for the children to get home from school. My daughter and I wanted cookies but we didn’t have many ingredients. We did a search and found this recipe. Thank you! So good and easy! Awesome! I wanted to make cookies since I was going to a wine tour – something sweet with my cheese and summer sausage – what a hit! Plus my kids will love them too! Never thought when I looked in my cuboard and found chocolate chip pancake mix and searched for a recipe for chocolate chip pancake cookies that I would actually find a one! Thank you! ?